Passengers boarding the 10:35 train from Manchester, Piccadilly to London, Euston are bound for work, assignations, reunions, holidays or new starts, with no idea that their journey is about to be brutally curtailed. Holly has just landed her dream job, which should make life a lot easier than it has been, and Jeff is heading for his first ever work interview after months of unemployment. They end up sitting next to each other. On board customer service assistant Naz dreams of better things as he collects rubbish from the passengers. And among the others travelling are Nick with his young family who are driving him crazy; pensioner Meg and her partner setting off on a walking holiday and facing an uncertain future; Caroline, run ragged by the competing demands of her stroppy teenage children and her demented mother; and Rhona, unhappy at work and desperate to get home to her small daughter. And in the middle of the carriage sits Saheel, carrying a deadly rucksack . . .
We see the pictures on the news of attacks and whilst we are horrified and sickened our lives carry on as normal. This story takes us into the lives of people involved in a terrorist attack and their struggle with the aftermath. The book is told in alternating chapters from the view point of the passengers and their families. We also learn the fate of the family the bomber leaves behind. The characters are so well written and every one of them is believable, I loved some characters and equally disliked others. 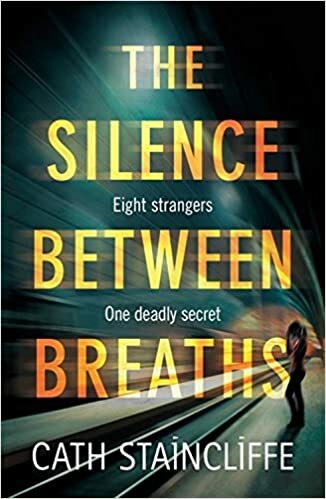 The Silence Between Breaths is a thought provoking, upsetting and rewarding story that will stay with me for a long time.